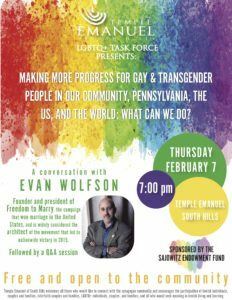 Mr. Wolfson is an internationally recognized civil rights lawyer who founded Freedom to Marry, the campaign that won marriage equality in the U.S. He is the author of Why Marriage Matters: America, Equality, and Gay People’s Right to Marry (Simon & Schuster, July 2004). He is also a Squirrel Hill native. The format will be a conversation with Mr. Wolfson, followed by audience Q&A. This event is free and open to the community, and is being sponsored by the Rabbi William Sajowitz Endowment Fund. More information is available at http://www.templeemanuelpgh.org/event/wolfson/. Become a 3RBA member today!